What are your top five geek loves? Doctor Who. Science! Science fiction. Tabletop/board gaming. Art. What inspired you to write Finder? I’m not much of a planner when it comes to writing things, so I started off with this mental image of a cable car in space and two strangers talking, so I started writing that scene and it just took off from there as I figured out who they were, how this cable car could reasonably exist, and so forth. How much of the world-building you dreamed up actually made it into the book? Some? A lot (though not all) of my science fiction is set in the same shared universe, so there are bits of the larger worldbuilding in Finder that I’d already established, but also a lot of stuff specific to Cernee which was an entirely new setting, Most of that is at least hinted at, but in my mind (and notes) there’s this wonderful history to the Shielders, and backstory for a lot of the characters that isn’t directly referenced but informed how they were written. How difficult is it to balance your writing with your job at Smith College as a database system administrator? Not difficult at all. I don’t think I could write full-time, and when I’m not actively writing I often have story problems floating around in the back of my thoughts, so I can solve a lot of things while I’m busy at work without either disrupting the other. Given your day job, do you find it hard being on a computer to write? Do you have any helpful tips for dealing with screens on a regular basis? I do get very sick of sitting at a computer, and it’s not healthy. So every day at work I try to take a short walk outside mid-afternoon to stretch and refocus (and sometimes to catch Pokemon) and at home I rarely have long stretches of unbroken computer time because I have children. Also I have a dog that I like to take on nice long walks and get some good fresh air. I like when I have a little tiny seed of inspiration — a science fact, an image of a scene, etc. — and somehow I manage to make a whole story around it. I’m not sure how that works, because it never seems like enough, but then it all starts falling together anyway. There is such joy in discovery. What is your writing process like? Is there a “best” part of the process? I’m not an outliner, so my first drafts tend to be a hellish mess of back and forth until I get to the end and it starts all looking clear in hindsight. Then I go back to shove it all into reasonable shape and (at least for longer works) will often then build my outline retroactively as I work through that second draft. That then gives me a roadmap for more fine-tuning. I used to hate revision, but I think as I’ve become more experienced and my first drafts are being slightly less horrible, revision has become both easier and more pleasant. The best part though is still getting to stick “THE END” at the end of a draft for the first time, because that’s the point at which I know for sure I’ve got a story, even if I’m nowhere near done with it. How did it feel winning the Hugo Award for Best Novellete? Oh, man, what a wild thing! I really loved several of the other stories nominated with me and so I went into it feeling like even if I didn’t win it was so incredibly cool, just for once, to be in such company and no matter how it went it was still so much joy to be there. And honestly I was really anxious about if I did win, what if I sounded stupid or fell off the stage or something like that. It still feels surreal. What kind of books do you enjoy reading? Do you have a favorite author, series, book? One thing about writing is that, at least for me, it comes almost directly at the expense of reading time, which makes me very sad. So I’m way less caught up with books than I used to be, though I still read a lot of short SFF (particularly in Asimov’s, Clarkesworld, and Interzone) because it’s more manageable but also there is so much wonderful short fiction out there that doesn’t get noticed as much as it should. For longer stuff, I recently finished Martha Wells’s Murderbot books which are incredible, and I’m reading Charlie Jane Anders’s The City In The Middle of the Night right now which is so very different from my own work but so extraordinarily compelling and beautiful. I think about the only thing I’m not a fan of are books that are relentlessly grim. Your thesis exhibition sounds incredible, any dreams of another exhibition for the future? What would the theme be? Sculpture was a lot easier when I didn’t have kids and a day job, and I don’t honestly know that I’d ever go back to doing something like that just because it feels like a whole different era of my life. At the same time I do have moments of thinking about making small artifacts related to my story worlds, just for the fun of it, and maybe someday I might. Or, basically, I don’t know! If you could dream cast Finder into a screen adaptation, who is your ideal actor for Fergus? I think James MacAvoy would make an excellent Fergus, and I’d absolutely throw Chiwetel Ejiofor in as Harcourt. I’m not sure I watch enough movies or TV to be able to cast Mari or the others very well, because they’d have to find just the right actress. What’s next for you? Any other projects on the horizon? I just handed in the manuscript for the sequel to Finder, Undertow, and starting to poke at the third book in the series, which has no title yet. Meanwhile I have a novella upcoming in the July/August issue of Asimov’s named Waterlines, and I’ll be working on some new short fiction this spring & summer. Suzanne Palmer is an award-winning and acclaimed writer of science fiction. In 2018, she won a Hugo Award for Best Novelette for “The Secret Life of Bots”. Her short fiction has won readers’ awards for Asimov’s, Analog, and Interzone magazines, and has been included in the Locus Recommended Reading List. Her work has also been features in numerous anthologies, and she has twice been a finalist for the Theodore Sturgeon Memorial Award and once for the Eugie M. Foster Memorial Award. Palmer has a Fine Arts degree from the University of Massachusetts at Amherst, where as a student she was president and head librarian of the UMass Science Fiction Society. She currently lives in western Massachusetts and is a Linux and database system administrator at Smith College. You can find her online at zanzjan.net and on Twitter at @zanzjan. 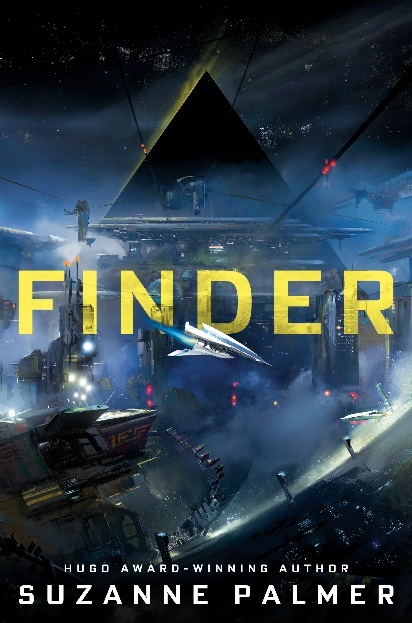 Be sure to check out Finder by Suzanne Palmer, available now from DAW Books! Or enter to win a copy for yourself right now! The fine print: Win one (1) copy of Finder by Suzanne Palmer. Must be a member of IGGPPC to enter. Ships internationally. Contest accounts automatically disqualified.